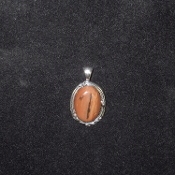 This AZ Petrified Wood cabochon is 25 x 18mm. It is set in a Sterling Silver setting. This item ships free anywhere in the continental USA.